I'm Ashley Dvorkin with a FOX Celebrity Profile on marine biologist Luke Tipple, featured on this year's shark week on Discovery Channel. I asked him what he feels is one of the biggest misconceptions people have about sharks: "That they want to eat us. People actually think that sharks go out and have a malicious intent to go and eat humans. It's not true. 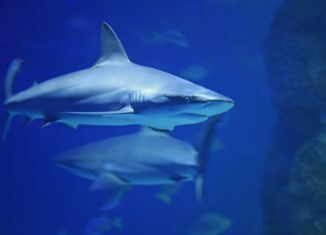 We're not on their menu, we're not even supposed to be in the water evolutionary wise, usually the sharks are just test biting opportunistically to see if, you know, perhaps that weird thing is food, that weird thing happens to be us." Though if face to face with one, yes he says, punching them in nose is a thing: "Absolutely. Yeah. I've punched many sharks in the nose not out of any malice, but just to let it know I'm not to be messed with and it does work. Well, the reason it works is because in their snout they have ampullae of Lorenzini, they also have very sensitive snouts, so the ampullae are like these electro receptors in their snouts. And if you hit them and you put damage there, it's like shocking their system."